The hero is a trainee on a scientific space station. One day he messes up an experiment and the professor gets possessed by an alien. Now he has to figure out a way to help the professor and to make sure no one get´s to know what happened. "Fun and great first game that has some funny moments. Overall not a ground breaking game, but will definitely keep you entertained for 20mins or so. Also notable are the great comical animations, and the catchy music. Developers show great potential. " 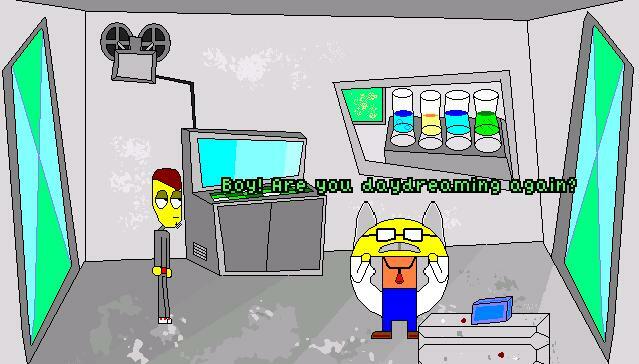 This is a very short adventure with lots of jokes (and a catchy character) (and some "random" puzzles). Worth its 20 mins. This game really captures the uneasy feeling you get when on a space station and in charge of chemicals, well done.